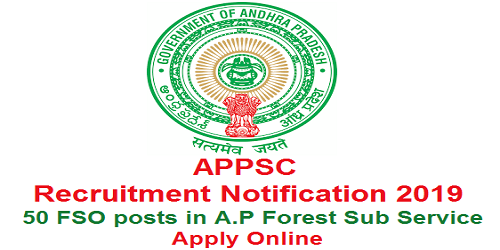 APPSC Recruitment Notification 2019: Andhra Pradesh Public Service Commission (APPSC) released a notification on 12th February 2019 which is related to A.P Forest Sub Service 2019 Recruitment for Forest Section Officer posts. The total number of vacancies available in this 2019 Recruitment of APPSC is 50 Forest Section Officers in A.P Forest Sub Service. APPSC is inviting all the eligible candidates to apply for this 2019 A.P Forest Sub Service recruitment through online. The online applications are available in the official website of APPSC https://psc.ap.gov.in from 26th February 2019. The candidates who are interested in this recruitment of APPSC and also eligible as per post requirement can apply for this recruitment through online on or before 20th March 2019. Before going to apply for it go through the entire details of the notification to understand the basic requirements of the recruitment like required educational qualification, Physical standards, age limits, selection procedure, how to apply, application fee particulars & etc. The candidates who are eligible as per the post requirement can apply for it through online on or before 20th March 2019. In this article we provided all the necessary details of APPSC Notification No. 06/2019 which is useful to the candidate who wants to know about the APPSC Recruitment 2019 for 50 Forest Section Officers in A.P Forest Sub Service, go through it or download the official notification. No. of Vacancies: As per the APPSC Notification No. 06/2019, the total number of vacancies available in this recruitment of APPSC is 50 Forest Section Officers in A.P Forest Sub Service. - Bachelor’s Degree in Botany or Forestry or Horticulture or Zoology or Physics or Chemistry or Mathematics or Statistics or Geology or Agriculture as a subject or Bachelor’s Degree in Engineering with Chemical Engineering or Mechanical Engineering or Civil Engineering from any recognized University/Institute. Fee Particulars: Pay the Application Fee & Examination Fee through Online using Payment Gateway through Net Banking /Credit Card/Debit Card. - In case of any corrections Rs. 100/- per correction will be charged. Note: Examination fee is exempted for SC, ST, BC, White Card holders of A.P State & Un-Employed youth of A.P. Online applications are opened from 26th February 2019. Last date for online application submission is 20th March 2019. Last date for fee payment is 19th March 2019. APPSC Recruitment Notification 2019: Andhra Pradesh Public Service Commission (APPSC) released a notification on 23rd January 2019, which is related to A.P Economics and Statistical Sub Service recruitment for Assistant Statistical Officer posts. 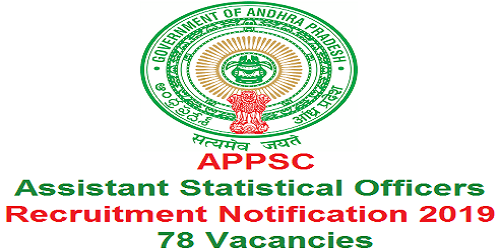 As per the official information the total number of vacancies available in this APPSC 2019 Recruitment is 78 Assistant Statistical Officer posts in A.P Economics and Statistical Sub Service. APPSC is inviting all the candidates who were eligible to apply for this recruitment through online. The online applications for this 2019 APPSC Recruitment for Assistant Statistical Officers are available in the official website of APPSC https://psc.ap.gov.in from 12th February 2019. The candidates who are interested to apply for this APPSC Assistant Statistical Officer Recruitment 2019 can apply for it through online on or before 6th March 2019. In this article we provided all the necessary information of APPSC Assistant Statistical Officer 2019 Recruitment which is useful to government job aspirants and the candidates who are interested in this recruitment. The candidates who were interested in this APPSC recruitment 2019 first go through the details to understand the minimum requirements of the Assistant Statistical Officer post. The candidates who are eligible as per the post requirement can apply for it through online on or before 6th March 2019. Note: upper age relaxation is applicable for SC/ST, BC, PHP, Ex-Servicemen, N.C.C, A.P State Govt. Employees & Retrenched temporary employees in the state census department with a minimum service of 6 months as per government rules. - Bachelor’s Degree with Statistics as one of the main subjects. - Bachelor’s Degree with Mathematics (with statistics as a paper in 1 year or 2 years or all 3 years as the case may be) as one of the main subjects. - Bachelor’s Degree with Economics (with statistics as a paper in 1 year or 2 years or all 3 years as the case may be) as one of the main subjects. - Bachelor’s Degree with Commerce (with statistics as a paper in 1 year or 2 years or all 3 years as the case may be) as one of the main subjects. - Bachelor’s Degree with Computer Science (with statistics as a paper in 1 year or 2 years or all 3 years as the case may be) as one of the main subjects. Online applications are opened from 12th February 2019. Last date for online application submission is 6th March 2019. Last date for fee payment is 5th March 2019. APPSC Recruitment Notification 2019: Andhra Pradesh Public Service Commission (APPSC) released multiple notifications on 31st December 2018, here we discuss one of the notifications i.e., APPSC Notification No.29/2018. This Notification of APPSC is about A.P Information Service Recruitment 2019. This APPSC 2019 Recruitment is for the post of Deputy Executive Information Engineers. As per the APPSC Notification No.29/2018 the total number of vacancies available is 5 Deputy Executive Information Engineers in A.P Information Service. APPSC is inviting all the eligible candidates to apply for this A.P Information Service recruitment 2019 through online; the online applications are available in the official website of APPSC https://psc.ap.gov.in from 22nd January 2019. The candidates who are interested in this APPSC Deputy Executive Information Engineers Recruitment 2019 can apply for it through online on or before 12th February 2019. Before going proceed further to apply online for this recruitment, go through the entire details of the notification to understand the basic requirements of the recruitment like the required educational qualifications, Age limits, selection procedure, fee particulars, How to apply online & etc. The candidates who are eligible as per the post requirement of this APPSC Recruitment 2019 can apply for it through online. In this article we provided all the necessary information of APPSC Recruitment 2019 for 5 Deputy Executive Information Engineers in A.P Information Service, go through it or download the official notification. - Must Possess a Degree in Electronics or Telecommunication Engineering of a University in India Established or Incorporated by or Under a Central Act, Provincial Act or a State Act or any other equivalent recognized qualification. Note: Upper age limit relaxation applicable for some specified categories as per government rules. Application & Examination Fee: Pay the Fee through online using Payment Gateway using Net Banking/Credit Card/Debit Card. Note: examination fee is exempted for SC, ST, BC, PH, Ex-Servicemen, White Card holders (AP Residents), Unemployed youth as per G.O.Ms.No.439, G.A (Ser-A) Dept., dated:18th October 1996. Online Applications are opened from 22nd January 2019. Closing date of Online Application submission is 12th February 2019. Last date for Fee payment is 11th February 2019 up to 11:59 PM. 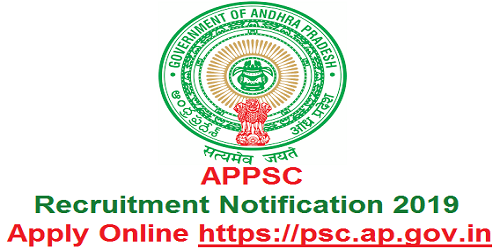 APPSC Recruitment Notification 2019: Andhra Pradesh Public Service Commission (APPSC) released multiple notifications on 31st December 2018 which is related to its 2019 recruitment. Here we discuss one of the notifications and that notification is about A.P Fisheries Service 2019 recruitment. 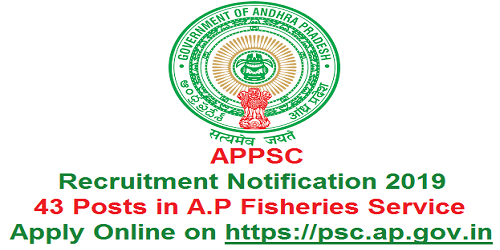 This A.P Fisheries Service 2019 Recruitment is for 43 Fisheries Development Officers. APPSC is inviting all the interested candidates who were eligible to apply for this recruitment through online. The online applications for this APPSC Fisheries Service 2019 recruitment are available from 17th January 2019 in the official website of APPSC https://psc.ap.gov.in. The candidates, who are interested in this 2019 recruitment of APPSC for 43 Fisheries Development Officers in A.P Fisheries Service, can apply for it through online on or before 8th February 2019. Before going to apply for this APPSC Recruitment, go through the entire details of the notification to understand the basic requirements of the post and also about the recruitment process. In this article we gave all the necessary information of APPSC Recruitment 2019 for 43 Fisheries Development Officers in A.P Fisheries Service like eligibility criteria, recruitment process, Application & Examination fee particulars, important dates & etc. Go through the article or download the official notification. The candidates who are eligible as per the post requirement can apply for this APPSC Recruitment through online on or before 8th February 2019. Note: Upper age limit relaxation for the specified categories is applicable as per the Government rules. Application & Examination Fee: Pay online using Payment Gateway using Net Banking/Credit Card/Debit Card. Note: Examination fee is exempted for SC, ST, BC, PH, Ex-Servicemen, White Card holders, un-Employed youth as per G.O.Ms.No.439, G.A (Ser-A) Dept., dated:18th Oct 1996 of AP State. Online Applications are opened from 17th January 2019. Last date for submission of Online Application is 8th February 2019. Last date for Fee payment is 7th February 2019 up to 11:59 PM. 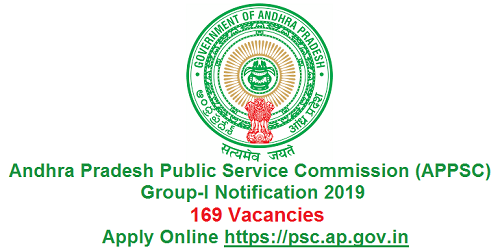 APPSC Group-I Services Notification 2019: Andhra Pradesh Public Service Commission, Vijayawada recently released so many recruitment notifications on December 2018. In this article we discuss about APPSC Group-I Services notification, APPSC released the Group-I services Notification with the Notification No.27/2018 on 31st December 2018. As per the notification of APPSC the no. of vacancies available in this recruitment is 44 Carried Forward Vacancies and 125 Fresh Vacancies. APPSC is inviting all the interested eligible candidates to apply for this APPSC Group-I Services 2019 recruitment through online; the online registrations are accepted from 7th January 2019 to 7th February 2019. The online application links for this APPSC Group-I services 2019 Recruitment are available on the official website of APPSC https://psc.ap.gov.in from 7th January 2019 .The candidates who are interested and also preparing for Group-I Services exam, apply for this APPSC Group-I Services 2019 Recruitment on or before 7th February 2019. Before going to apply go through the entire details of the APPSC Group-I Services 2019 notification like the eligibility criteria, How to apply online, Selection procedure, Fee particulars & etc. Here we provided all the necessary information of APPSC Group-I services Notification 2019 which is useful to the candidates who were interested on this recruitment. Eligibility Criteria: Age limits and required educational qualifications for this APPSC Group-I Recruitment 2019 are given below. - Bachelor’s Degree from any recognized University/Institute or equivalent qualification. - Degree from any recognized University/Institute or any other recognized qualification. - Degree of Engineering (Fire) of any University recognized by the University Grants Commission or any other equivalent qualification. - Preference shall be given to persons possessing a degree in Sociology or Social work. Fee particulars: Pay the fee through Online using Payment Gateway using Net Banking/Credit Card/Debit Card. Note: Examination fee is exempted for SC,ST, BC, PH, Ex-Servicemen, White card holders of AP State and Un-Employed youth as per G.O.Ms.No.439, G.A (Ser-A) Dept., dated:18/10/1996 of AP State. 2. Main Written Examination: 5 papers 150 Marks for each paper and time duration is 180 Minutes for each paper. Online applications are opened from 7th January 2019. Last date for Submission of Online Application is 7th February 2019. Last date for Fee payment is 6th February 2019.